In case you haven’t noticed, I’m in Portland having a major eating fest. We’re only here for three days, so my FOMA requires me to overeat at every meal to make sure I don’t miss anything. It’s a tough job, but someone’s got to do it! We’ll just call this endeavor Operation SMF (stuff my face). 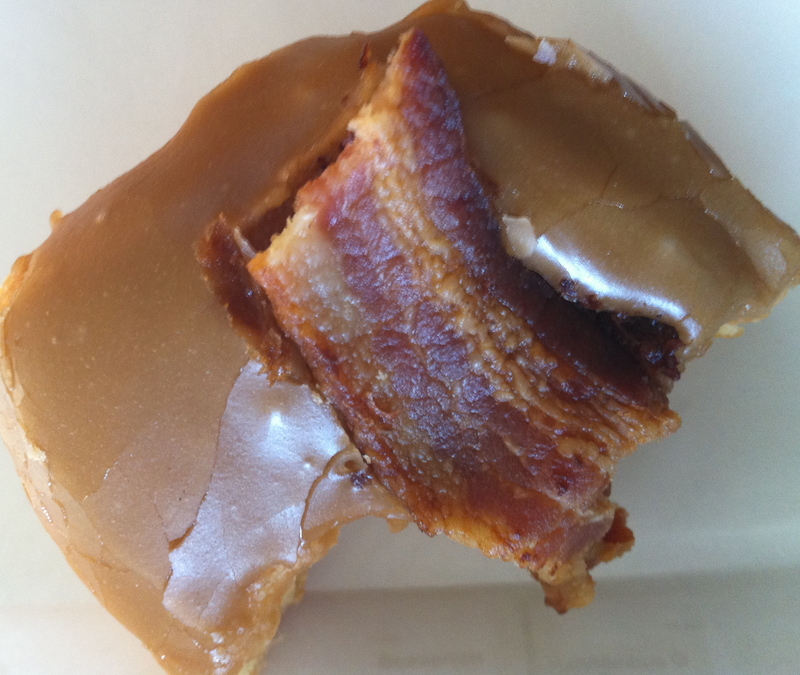 I awoke this morning to my friend bringing me yet another bacon maple doughnut from Voodoo Doughnut. What a great way to start the morning. 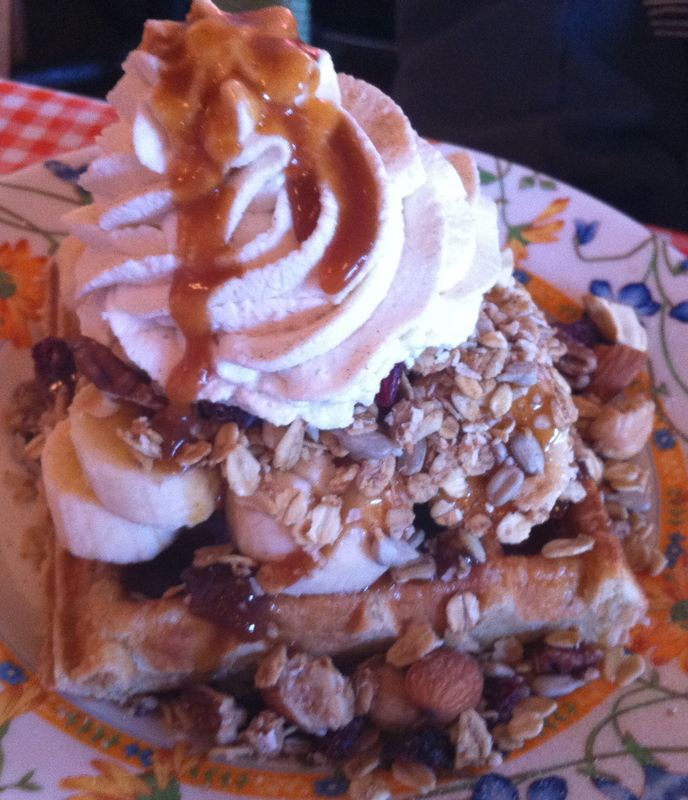 Then we headed to the first place on my eating itinerary, which was Waffle Window. 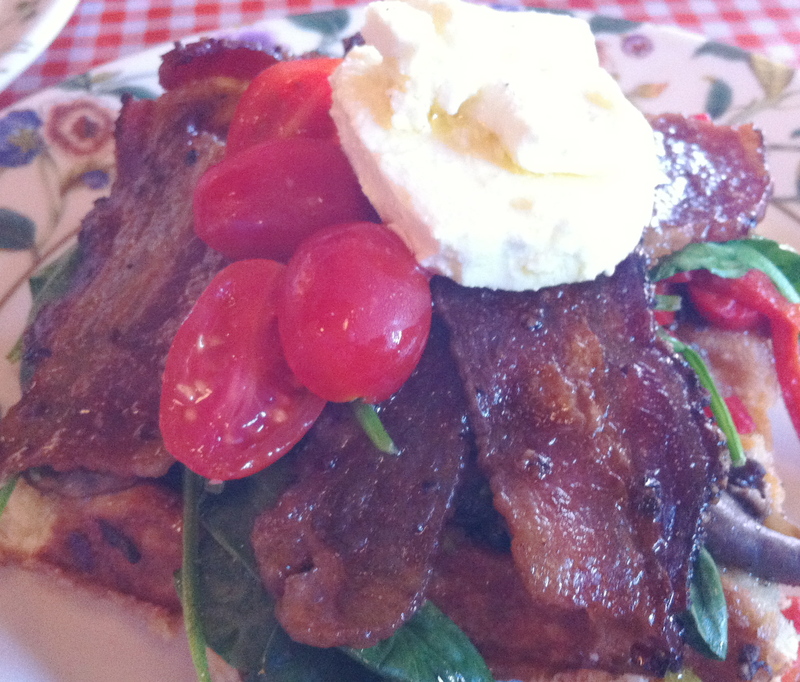 I had The Whole Farm waffle (pepper bacon, mushroom, spinach, roasted pepper, tomato, and marinated chevre). My friends had The Three B’s (pepper bacon, brie, basil, and peach jam) and Banana Rumba (bananas, banana caramel sauce, whipped cream, granola crunch topping). I really liked the combo of the brie and peach jam on The Three B’s and the Banana Rumba was really delicious. I just don’t think I could have eaten a whole one at one sitting. I’m much more of a savory food person than a dessert person. Mine was definitely the best, but I wouldn’t say Waffle Window is a must visit place. That said, it was pretty darn delicious and really inexpensive. The waffles don’t look that big, but I couldn’t finish mine despite putting forth my best effort. Operation SMF also requires me to exercise some willpower so I can eat at many different places each day. Don’t I sound responsible? I can’t adequately describe the deliciousness of this combo, but I will try. The doughnut was perfectly pillowy and the maple frosting was just the right amount of sweet to balance the salty bacon that was the perfect combo of crunchy and fatty. Mmmmm. We also tried the McMinnville Cream (cream filled doughnut with maple frosting), Dirt Doughnut (vanilla frosting with Oreos), and a Dirty Snowball (chocolate doughnut with marshmallow topping, coconut, and peanut butter). They were tasty, but kind of just your average doughnut in interesting flavors. 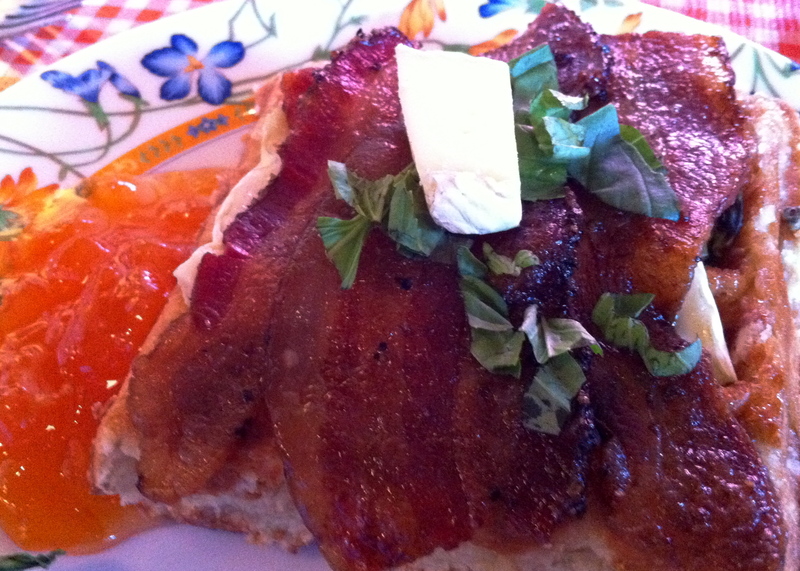 The definite doughnut to pay a visit to here is the Bacon Maple Bar. Mmmmmmm.